This book appeared just a year ago and I’m now in my second summer of peach fantasy. This is one of those niche cookbooks that you’ll treasure and that you will use year after year. Since it is high peach season, you might want to sample the treats of The Perfect Peach yourself. The Masumoto family’s journey to a California organic peach farm had a difficult beginning. During World War II, the family was interned. They purchased land in 1948 and now the third and fourth generations operate the farm and promote peaches. Simply put, they grow, and they know, peaches. Recipes aside, Chapter One: A Peach Primer is totally worth the investment in dollars and time in this book. For decades, I have struggled with peaches. Buying, ripening, planning to use, and then throwing away peaches that had spoiled before I had a chance to enjoy them. In fourteen pages, you get an education about how to buy — and when not to buy, the anatomy of different peach varieties and the implications for your cooking, storing, ripening techniques and — most importantly — how to judge peach ripeness. Over decades, the Masumotos have created their own list of ripeness categories: hard, firm, give, soft, gushy, bruised, mealy and dehydrated. A peach in some of those categories, like hard or mealy, is unusable. But the other categories can be employed, with perhaps a bit of creativity. So all the recipes in this book do explicitly indicate what ripeness level is best for that particular dish. For example, an overripe gushy peach, maybe with some bruising, is prefect for a peach agua fresca. It has the sweetness and flavor levels that deserve to be drunk. On the other hand, for a savory salad dish — Shaking Beef with Peaches — a peach with only just a little give is ideal to stand up to the heat of cooked meat and jalapeno chile and soy sauce. Suzen and I have made a half dozen recipes from this book this season. I’ve blogged one —the agua fresca — and I keep making it a couple of times a week. It’s delish. It took some bravery on my part to make the Peach Day Pickles: peach + vinegar + mustard. That is just not a combination that fits within the span of my culinary fantasies. But, as I will post, I made the dish and it is a wonderful side dish for a night filled with barbecued steak or chicken or fish. 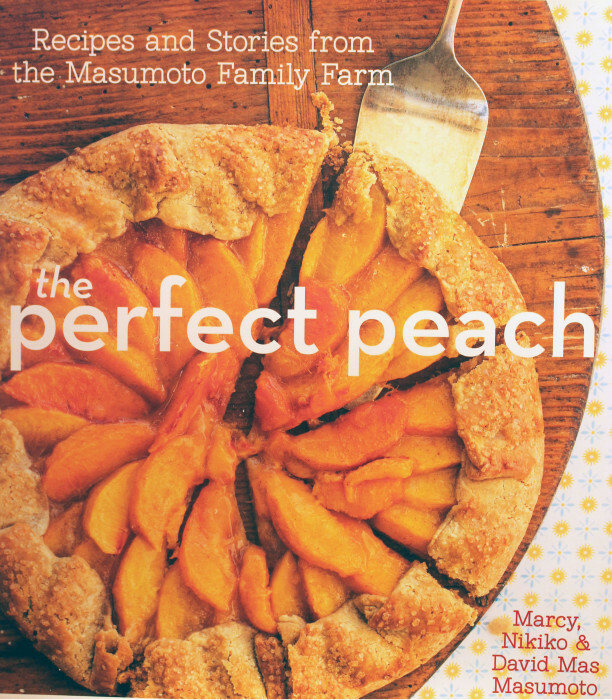 If you like peaches, but like me had some difficulty in using them, if you like peach flavor but thought only about peach pie, then The Perfect Peach is the perfect book to expand your peach horizons.